In the weeks leading up to the Sunbelt Ag Expo, hay and baleage producers in the Southeast have an opportunity to prove their hay is the best! 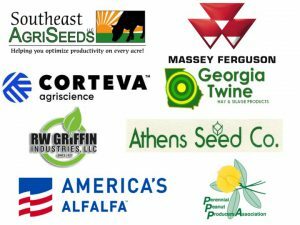 The Southeastern Hay Contest presented by Massey Ferguson is premiere forage quality contest in the Southeast, with entries coming from hundreds of producers across 13 states. Winners will be announced at a special ceremony on opening day of Sunbelt Expo. Our goal is to demonstrate the potential to produce high quality hay and baleage, showcase the management abilities of our SE growers, and highlight the technology and equipment that make it all possible! Building on the success of the first 13 years of this annual event, we are excited to continue our relationship with Massey Ferguson as the title sponsor for the SE Hay Contest! They will be providing the Grand Prize the use of a new DM Series Professional disc mower or Massey Ferguson RK Series rotary rake for the 2020 hay production season AND a $1000 cash prize! We are also excited to have sponsorships that will provide cash prizes within each of the 7 categories (see our sponsor’s logos below)! These sponsorships will provide cash awards to the top 3 places in each category (1st prize $150, 2nd prize $100, and 3rd prize $75)! Big Thanks to Our Sponsors!!! There are many economic reasons why SE growers have increased the quality of the forage they produce (e.g., unprecedented prices in the livestock sectors, great demand for their products, need for efficiency due to high input costs, etc.). But, the keys to success have been timely management, improved forage varieties, advanced harvest equipment, and related technologies that have come to the market over the last 10 years. It is hard to recall a more exciting time in the hay and forage industry! So, is your hay and baleage the class of the field? Think you can vie for a winning combination? If so, then check out the rules and entry forms and enter today! The deadline for entry into the SE Hay Contest is 5 p.m. on Thursday, September 19, 2019. While you’re at it, take time to advertise your high quality forage in the SE Hay Directory. The SE Hay Directory seeks to connect our high quality forage producers with buyers who value this product. Read more about the SE Hay Directory on page 4 of the SE Hay Contest and Hay Directory Rules and Entry Form. Click here to download RULES and ENTRY FORM!